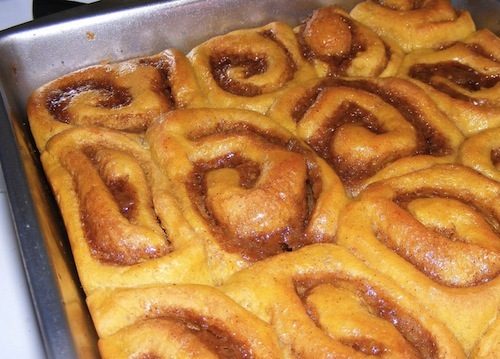 Everyone loved these vegan cinnamon buns. I was looking for a healthy cinnamon rolls recipe, and I came across this recipe from Don’t Eat Off the Sidewalk, a great vegan blog. I changed it a bit. Halved the recipe but still used the full packet of yeast. Doubled the amount of filling (meaning I used the normal amount, even though I was halving the recipe). It’s not quite vegan, because I used honey in the glaze… But only because I didn’t have powdered sugar. So you can easily make it vegan again. Mix the yeast and water and let it sit for 5 minutes. Mix the pumpkin, milk, butter, sugar, salt, and spices – put it in the microwave for 20 seconds to bring it to room temperature. Add the pumpkin mix to the yeast water and mix until smooth. Add the 1.25 cups of flour; mix until smooth. Use some of the 1/2 cup of flour to dust a surface for kneading. Then sprinkle flour on the dough and knead for 10 minutes, continually adding the remaining flour so that the dough doesn’t become too sticky. Coat a bowl with nonstick cooking spray and place the dough inside, rolling it around to coat it with the spray as well. Leave in a warm place, covered, for about 45 minutes or until the dough has at least doubled. Punch the dough down and let it sit, covered, for 5 more minutes. Make the filling – mix together the sugar, flour, cinnamon, and margarine. Flour your surface again and roll the dough out into a 10 inch square. Spread the filling out (I used my fingers) all over the dough. Roll up the dough into a cylinder and pinch the ends closed. Cut the cylinder into slices – the thicker they are, the bigger the buns will be. I made about 14, including the end bits. Spray nonstick cooking oil in a square pan and place the rolls inside. Cover and let them rise for about 25 minutes; they should double in size. Bake the rolls for 20 minutes or until golden. Let cool for 20 minutes. Mix the honey, sugar, water, and vanilla together and drizzle over the buns. I think these healthy cinnamon rolls would be great warm with vanilla ice cream… Unfortunately I didn’t have ice cream, and now they’re gone. Guess I’ll have to make another batch. Skip the honey, skip the powdered sugar — how about a maple glaze with the pumpkin? This is my favorite kind of vegan food — you don’t have to apologize for its vegan-ness, you don’t have to hide it, you don’t have to preach about it — because it’s better than anything containing animal products anyway! Hey, I attempted to make this recipe today and failed miserably. My dough didn’t rise and it was WAAAAY to wet and stacked all over the bench. I put heaps of flour to help me to roll it and it turned out hard. I am very sad 🙁 BUT! I don’t want to give up and would like to try again. Can you suggest any reason of my failure and tips to improve? Please help! Also, what flour should I use for this? I don’t have all purpose at home.. Only plain, self raise, all purpose pastry mix and pizza mix from orgran, wholemeal spelt, wholemeal plain, rice, corn and soy flour.